This is by far our most popular, finest, high density high quality foam. This provides outstanding durability, with excellent recovery properties making it the obvious choice for everyday use. We recommend the soft option for back cushions. The medium option is commonly used for, a firm back cushion providing more support with a maximum of 4 inches, a comfortable seat cushion or mattress with the minimum thickness of 5 inches. The firm option in an ideal foam suitable for both bedding and seating in caravans, motors-homes and boats, where the cushions have to be utilised for both sitting and sleeping and where space is restricted. Sofa and chair cushions below 5" and other cushions like dining chair seat pads and window seats need to be a firm choice. This is a superior quality reflex foam, that offers exceptional durability and comfort. This is the plush feel foam recommended when replacing feather or fibre filled cushions with foam. This is also the only choice when looking for a luxury mattress. The foam offers support and comfort for a perfect nights sleep. The foams high density ensures a long life and the foam returns quickly to its original shape after being sat or slept upon, unlike many other soft foams. This is a high quality long lasting foam option. This is the economical foam but still better quality than most of our competitor’s bottom range so why would you buy a budget foam? This is ideal replacement foam for most seating applications. Available in Medium and Firm. The medium option is for a softer seat cushion or mattress, headboards and garden furniture. 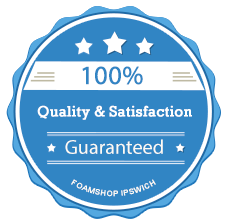 The firm foam is highly recommended for sofa cushions, conservatory seating and dining room chairs. This option is also suitable for both bedding and seating in caravans, motors-homes and boats, where the cushions have to be utilised for both sitting and sleeping and where space is restricted. This is extremely high in density and hard wearing foam. Suitable for support cushions, and thin dining chair pads where you are looking for long lasting comfort and support but are limited on thickness. This is great foam to raise cushions for people who are in chairs for long periods of time. This isn't suitable for use in mattresses because it has very little give when laying on it. Otherwise known as chip foam, this is the highest density foam and is extremely firm and hard wearing. This foam is the main filler for church pews, kneelers and pub seats. It is designed to be used in seats or cushions that are subject to high usage and need to have a long life span. When we have had pub stools and seats in we generally use a reconstituted foam base with softer foam on top to add the ‘cushion’ aspect to the seat. This could also be used as a support giving cushion when placed under an existing cushion or softer foam. It can also be used to gain extra hight under an existing cushion or to make the base firmer. This is not recommended for every day cushions. The polyester wraps give the cushion a rounded plumped finish which stretches out your covers for the ultimate finish.